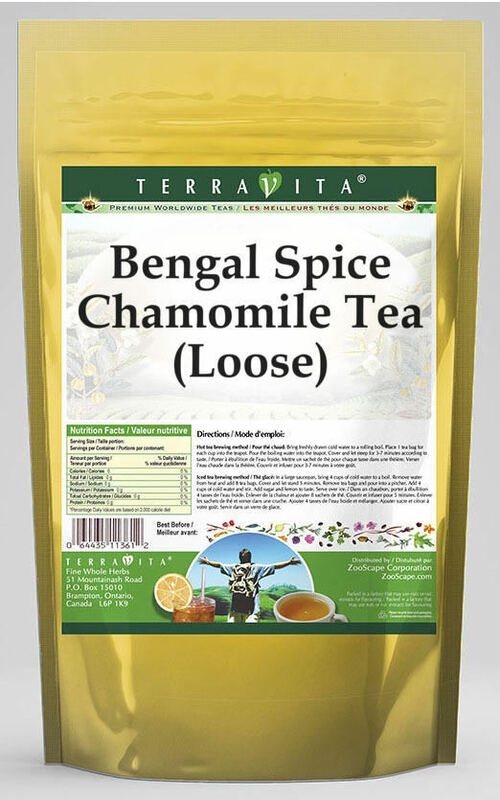 Our Bengal Spice Chamomile Tea is a delicious flavored Chamomile tea with Cinnamon Chips, Ginger and Cardamom Seeds that you will enjoy relaxing with anytime! The natural Bengal Spice taste is delicious! Buy 1 for $21.91Buy 2 / Save $1.17!Buy 3 / Save $4.38! Size (inches): 2.56" X 4.72" X 9.45"
Ingredients: Chamomile tea, Cinnamon Chips, Ginger, Cardamom Seeds and Natural Bengal Spice Flavor. Hot tea brewing method: Bring freshly drawn cold water to a rolling boil. Place 1 teaspoon of tea for each desired cup into the teapot. Pour the boiling water into the pot, cover and let steep for 2-4 minutes. Strain and pour into your cup; add milk and natural sweeteners to taste. Iced tea brewing method: (to make 1 liter/quart): Place 5 teaspoons of tea into a teapot or heat resistant pitcher. Pour 1 1/4 cups of freshly boiled water over the tea itself. Steep for 5 minutes. Fill a serving pitcher with 1/4 cold water. Strain and pour the tea into the serving pitcher Add ice and top-up with cold water. Sweeten and garnish to taste. "Herb teas are both culinary, medicinal."